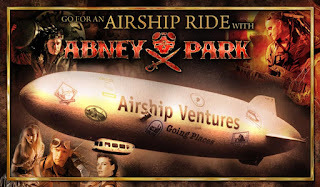 Abney Park has partnered with Airship Ventures for a historic flight! This October, Airship Ventures will return airship travel to the people --- with the first commercial airship flights in the U.S. in over 70 years, aboard the largest Zeppelin in the world! And this October 31st, you can come along on a flight into history with Abney Park! Hell, if you want us too, we can even play you a few songs on the flight! There are only 8 seats remaining on this momentous flight, and it’s less then a month away, so contact me (Captain Robert) ASAP if you’re interested. The Flight will be in the Bay Area, and the opening day of the California Steampunk Convention, so odds are you’ll be in town already! email robert@abneypark.com for more details. Curious about the band? View their video "Airship Pirate"
Interested in booking a charter for your own organization or special event? Contact Joanne Fedeyko , our Corp. Sales & Events Manager. You probably wont post this but anyway... Airship Industries (USA) Inc started their second Skcruise operation out of Oakland in 1985. Scheduled fare paying pax flights. Both The Lightship Group and Airship International had public fare paying flights in the 90s. Lets keep it truthful. 8 seats left? Does that mean only 4 have been sold? It was Captain Robert who wrote the piece we quoted, not us. We don't edit quotes from others. We have reminded him that blimps have occasionally flown passengers commercially and that it is passenger Zeppelin flights that are returning. You can't blame him his enthusiasm and shouldn't pour cold water all over it. He posted when he had just chartered the airship so there were still seats left. I believe they're now selling out more flights. Of course, the experience is very different, much quieter, than the blimps you mention.